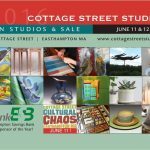 Please Join us for the Cottage Street Open Studios sale, May 5th 10-5 and May 6th, 12-5. An opportunity to purchase the perfect piece of art for your home or something locally designed and crafted for a wedding present or Mother’s Day. You’ll get a peek into the creative process in 24 unique artist and craftspeoples studios and have an opportunity to support local artists who bring beauty and creativity into challenging time. Thanks!! Hope to see you! and please help spread the word.